Victims of the Malmedy Massacre taken on 14 January 1945. National Archives Image from the Collection of The National WWII Museum. 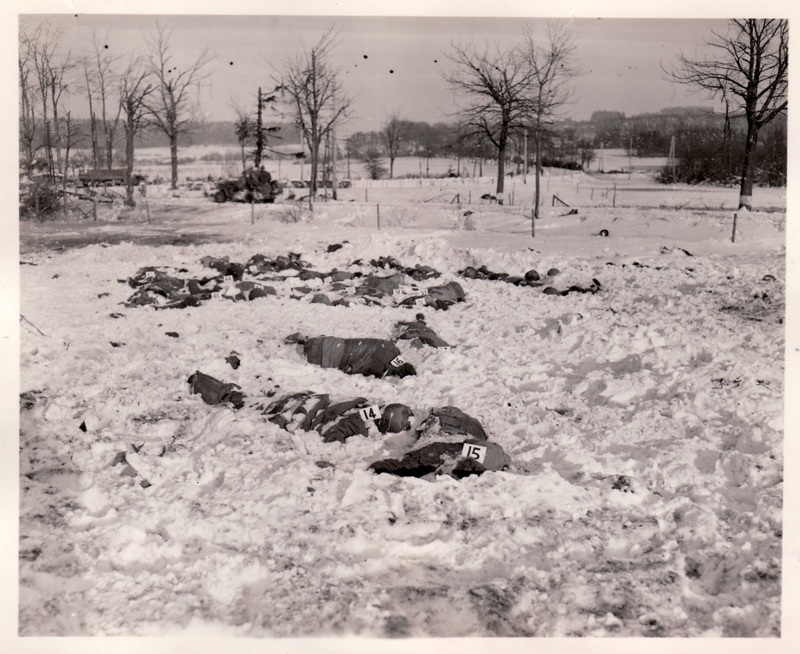 Seventy years ago, in the days of January 13th and 14th American troops began to uncover this gruesome scene in the snow in Belgium. The murder had occurred weeks earlier; murder, because the American victims had already surrendered to the Germans and were thus afforded the rights of POWs under the Geneva Conventions. Instead of being held captive and transported to a POW camp, on December 17th, 1944, outside of Malmedy, Belgium, 84 American POWs were murdered by their German captors, part of the 1st SS Panzer Division. The war crime now known as the “Malmedy Massacre” was part of a series of such killings in which 362 American POWs (and over 100 Belgian civilians) perished. 73 men were tried for these crimes in the War Crimes Trials held at Dachau in 1946, in which 1,672 German war criminals were charged. Of these 73, 42 received death sentences, 21 life imprisonment and the rest, long sentences. All of these sentences were eventually commuted and by 1956, all had been released from prison. See an interview with Ted Paluch, survivor of the massacre on our Digital Collections site, recorded in October 2009 by the Museum’s Manager of Research Services Seth Paridon. And read more about Paluch in this Oral History Spotlight, previously featured on our blog. See also the entry on this tragedy in our digital exhibit on POWs in Europe, Guests of the Third Reich.